The Patriots were covering the four-point spread in Sunday's AFC Divisional Round playoff game for all but 10:32 of their 41-22 beatdown of the Chargers at Gillette Stadium on Sunday. 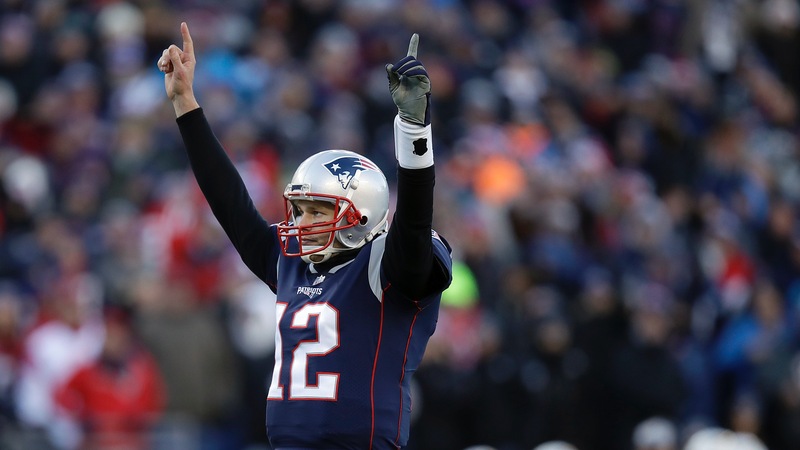 The Patriots were [covering the four-point spread](https://www.betchicago.com/chargers-patriots-betting-lines-records-ats-pick-sharp-action-nfl-playoffs) in Sunday's AFC Divisional Round playoff game for all but 10:32 of [their 41-28 beatdown of the Chargers](http://www.espn.com/nfl/game?gameId=401038959) at Gillette Stadium in Foxborough, Mass., as New England improved to 9-0 straight up and 7-2 against the spread at home this season. <a href="https://www.youtube.com/watch?v=EZwUxu4KkXs" class="embedly-card" data-card-width="100%" data-card-controls="0">Embedded content: https://www.youtube.com/watch?v=EZwUxu4KkXs</a> The Patriots (12-5, 10-7 ATS) advanced to the AFC Championship Game [for the eighth straight season](https://en.wikipedia.org/wiki/AFC_Championship_Game#List_of_AFC_Championship_Games), extending their own record. They'll play the Chiefs (13-4, 10-6-1 ATS) -- one of only two teams to cover the spread against them at home (Buffalo was the other) -- at 5:40 p.m. CT next Sunday. But unlike [New England's 43-40 Week 6 victory](http://www.espn.com/nfl/game?gameId=401030779) as a 3.5-point favorite, this time top-seeded Kansas City will have home-field advantage. The Chiefs opened as a three-point favorite, well before Sunday's game even went final. <a href="https://twitter.com/betchicago1/status/1084535141417058306" class="embedly-card" data-card-width="100%" data-card-controls="0">Embedded content: https://twitter.com/betchicago1/status/1084535141417058306</a> Hitting the road might be an issue for the No. 2 Patriots, where they were only 3-5 SU and ATS. That includes outright losses to the Jaguars (5-11), Lions (6-10), Dolphins (7-9), Steelers (9-6-1) and Titans (9-7), all non-playoff teams. ## Chargers-Patriots betting recap But that's tomorrow's concern. Sunday was a rout at halftime, as New England jumped out to a 35-7 lead behind touchdowns from Sony Michel (three rushing), Philip Dorsett (from Tom Brady) and Rex Burkhead (rushing). The Pats only scored six points in the second half on two short Stephen Gostkowski field goals, while Melvin Gordon hit paydirt for the Chargers and Philip Rivers threw late touchdown passes to tight ends Virgil Green and Antonio Gates. The Gordon touchdown made the score 38-14 Patriots, and also pushed the game OVER its total of 47.5. Los Angeles (13-5, 10-8 ATS) covered its -1 second-half spread, and the 23.5 second-half total went OVER with Gates' 8-yard touchdown reception with 59 seconds to play. <a href="https://twitter.com/betchicago1/status/1084536855629123586" class="embedly-card" data-card-width="100%" data-card-controls="0">Embedded content: https://twitter.com/betchicago1/status/1084536855629123586</a> The Chargers were 8-1 SU and ATS on the road this season, including an outright win in Kansas City and the only loss coming at the crosstown Rams, who are in the NFC Championship Game. ## Chargers-Patriots props All five props from [this post](https://www.betchicago.com/five-prop-bets-chargers-patriots-afc-divisional-playoff) either hit or went OVER, which isn't too surprising in a game with 69 total points and the teams combining for 833 offensive yards. Most of the player props went OVER, as Brady threw for 343 yards on 34-of-44 passing, but only one touchdown (so that was UNDER two at -135). Michel, who scored first (6/1) ran for 129 yards and three touchdowns on 24 carries, James White had 15 (yes, 15!) catches for 97 yards, Julian Edelman had nine receptions for 151 yards and Dorsett added a touchdown catch on his four receptions. Rob Gronkowski was one of the Pats' few disappointments, with only one catch for 25 yards. For the Chargers, Rivers was 25-for-51 passing for 331 yards, with three TDs and a pick. Gordon was held to only 15 yards on nine carries. Keenan Allen caught a 43-yard touchdown in the first quarter, and Tyrell Williams led L.A. with five receptions for 94 yards. Of the more obscure game props people enjoy playing, the Patriots had more than three straight scores, there was a successful two-point conversion and the highest-scoring quarter was a tie between the first and second (21 points each).